Although there are some gloves that can work for two or even all of these three categories, we highly recommend getting a separate type of gloves for each category. The main reasons are: your gloves will last longer and each type will be better suited to prevent injury in different applications. 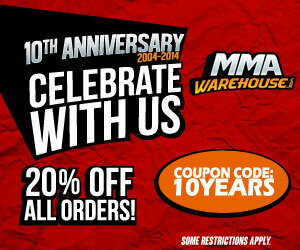 Sparring gloves are designed specifically for protecting both MMA fighters and used only during practice bouts. It’s very important that you buy gloves that clearly state that it is suitable for sparring; check the label and description thoroughly. 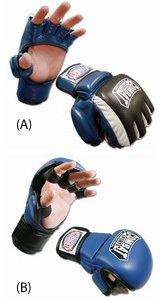 If you get the wrong gloves, you can seriously injure your sparring partner.There are basically two types of sparring gloves: (A) ones that look like traditional MMA gloves and have individual fingers slots or (B) gloves that have a large padded striking area and finger loops. Both types are sufficient for sparring and it really comes down to personal preference, I personally like the ones with individual finger slots. Also notice that the sparring gloves have more padding than other gloves. These bag gloves are cushioned to protect the MMA fighter against the increasingly heavier forces of striking heavy bags and striking pads. Typically, these gloves have increased wrist support and more compact and dense padding. Some bag gloves may have a grip bar built into the glove. Remember do not hit a heavy bag unless wearing the proper bag gloves and do not use bag gloves for sparring, you will injure your partner. 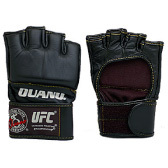 These gloves are also designed to protect both MMA fighters, but have a lot less padding than sparring gloves. Fight gloves are designed for real competition. 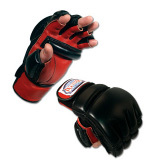 Some MMA sparring gloves can be used for fighting, but many of them are 5 ounces and larger and may not be legal for MMA competition. Check with your fight organization. Fight gloves are usually 4 oz, and they have little to no padding.DO NOT USE TO TO SPAR. A note on MMA handwraps: Many people do not use them when practicing MMA, but they are highly recommended.A serious hand injury can keep you out of training for months. Your hands are a very important asset and it is worth the time to wrap them. Also, you will have to have wrapped hands during MMA competition, so it is nice to get use to it. If you are having problems fitting your wraps into MMA gloves, many brands now sell MMA wraps, which are shorter and narrower wraps. These may also be called junior or kids wraps.